A well-planned job not only can greatly reduce the time the work takes, but it also ensures a quality job and makes the work much more satisfying for the tradespeople who complete it. Planning is the process of receiving a problem, deciding on a solution and issuing instructions so that anyone can complete the work exactly as the planner intended. Planning is completely independent of scheduling and is a different process. Adding a job to a list of work to be done on a shutdown or next week is not planning. All work is planned by someone at some time, but for the best results, the planning process should be separated from the execution of the work to ensure it is well-organized before it begins. The five steps in detailed planning are: deciding on the appropriate solution; listing all the steps required to complete the work; listing all the materials, tools, equipment and information required and where each is located; estimating the time for each step and for the whole job; and attaching any sketches, drawings, photos, instruction manuals and standards required. The detailed work planning process is best illustrated with an example. In the following example, the job is a "redesign" (not maintenance) and will be carried out by one tradesperson. The work is for a mining company and involves installing a fume hood in a small laboratory at a field office about a 40-minute drive from the central workshops. This example is very detailed, which is appropriate for a remote job where missing materials or tools could result in a long and expensive delay. For work that is close to a central shop, less detail is required. The single tradesperson who will be assigned can do all the work without any restrictions. The department is well-organized with accurate records. There is a shop van stocked with many commonly used supplies and tools, and the inventory is checked frequently so tradespeople can be confident that the parts and tools that are supposed to be in the van will be there when needed. 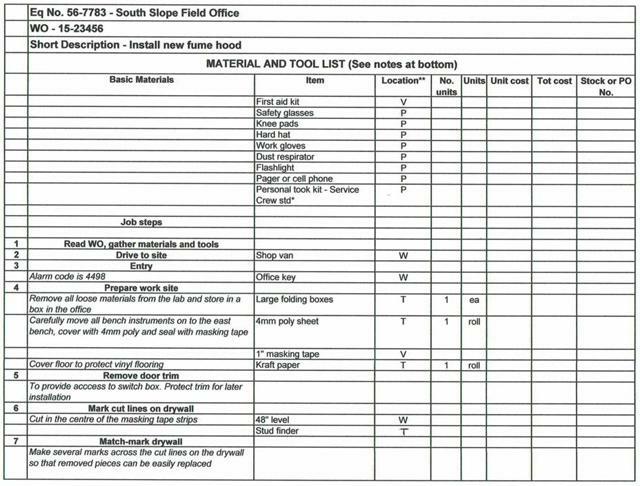 There is a list of standard tools that each tradesperson must keep in his or her personal toolkit and take to each job. A "work order kit" process is in place so materials from stores and direct purchases are staged in an appropriate place, identified by the work order number and managed by the store's staff. Now review the plan below. 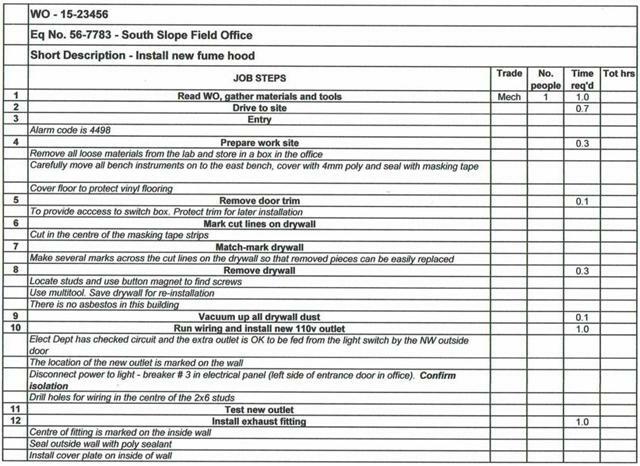 This is the detailed work order form with all information including scheduling details, etc. 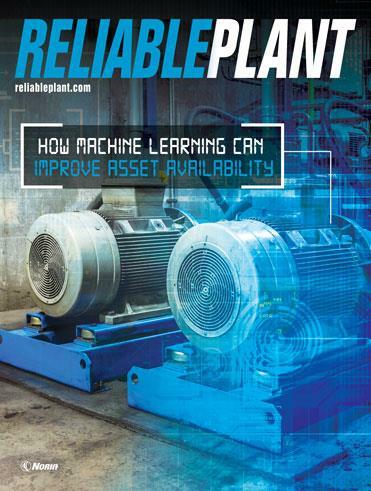 Note the comments that answer the anticipated questions, such as the reason for the job, the absence of asbestos and the capacity of the electrical circuit. A sketch can be helpful to understand the job scope, although perhaps unnecessary in this example because the planner has marked the locations of the new electrical outlet and the new fume hood on the lab walls with masking tape. This is the start of the process of "thinking through" the job and is often best done onsite. Each step is small enough so a tradesperson or planner can easily think of each required tool and material. Note that all steps in the job, including preparation, transport and clean-up, are listed. This is where the planner can enter important instructions against each of the steps listed above, including safety tips, equipment protection, assembly instructions, etc. At this point, an estimate for the time each step will take can be added. All materials and tools should be included except for small tools that are a part of each personal toolkit. A job can be stopped for the lack of a fastener just as it would be for the lack of a large component. By concentrating on only one small step at a time, it is unlikely that an experienced planner or tradesperson will overlook any items. 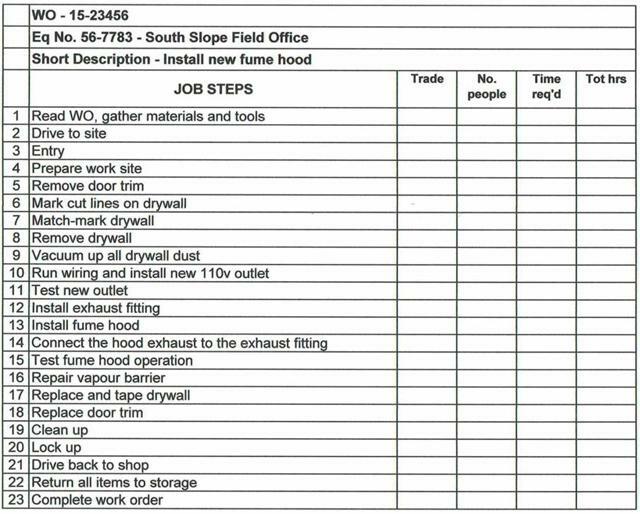 In a good maintenance computer system, this list of materials and tools can be filtered to show only those items in the work order kit or those that will come from the tool crib. This simplifies the process of gathering all materials before the job begins and helps avoid overlooking any item. If more than one person or team is assigned to a job, there may be "parallel" activities that could be used to build a critical path network. For example, if two people were assigned to the fume hood installation, one could install the ductwork while the other installed the electrical outlet. No matter how many people are assigned, each step in the job should be planned in detail. To some, this plan may seem overly detailed. However, on a reasonably complex job like this with several steps, it is easy to miss an important item, even for those who are familiar with the work. Remember, every step, tool and material listed on the plan must be decided and acted on at some time by someone, whether the work is planned or not. In this example, any need to return to the shop or stores will result in a delay of approximately 90 minutes and will force the job into the next day with yet another 90 minutes of travel time. 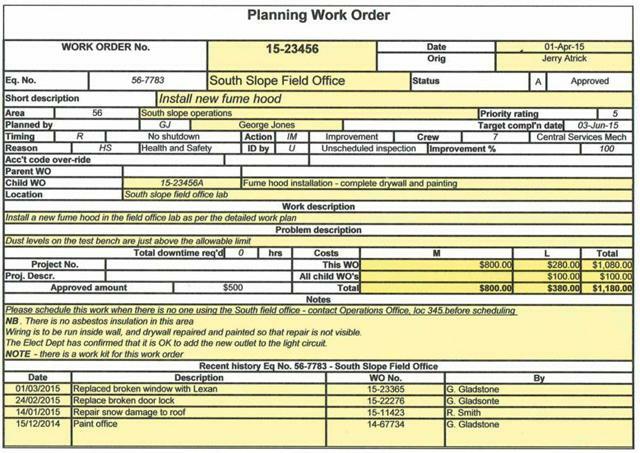 An experienced planner should be able to complete the work order package in this example in less than an hour, excluding the time taken to visit the site. Of course, if the planner is not sure of the best way to address any part of the work, it will be essential to get input from others, such as tradespeople with the appropriate experience. It is a good practice to assign this kind of detailed planning to tradespeople, even if the people who prepare the plan will do the work themselves. 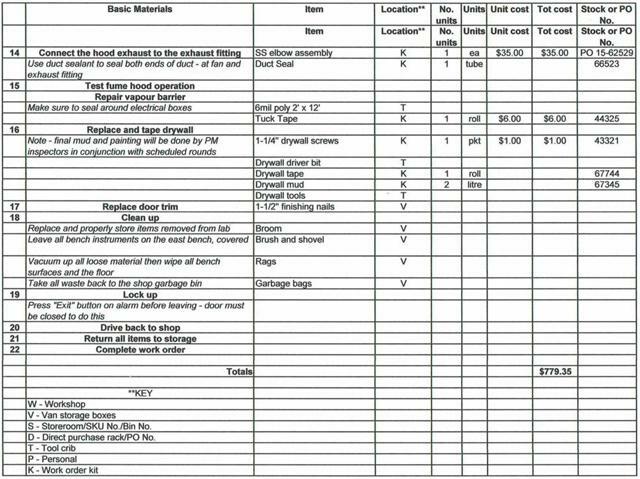 Much of the detail, such as listing the tools and supplies required, need only be handwritten and attached to the work order hard copy. 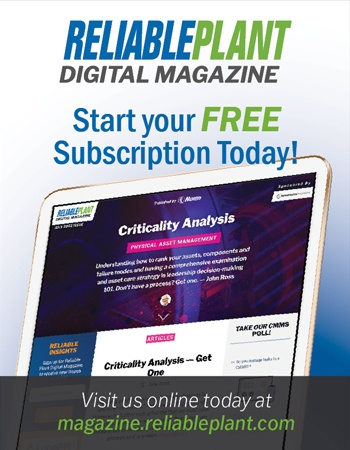 For a job like this, a fully detailed plan could easily reduce the time to complete the work by 50 percent or more, compared to an unplanned approach. Detailed plans should be prepared for all shutdown work in continuous operations and for work that will take place remotely. For all other work, the same principle of "thinking through" the job should be employed, but the level of detail can be reduced and more of the planning function can be delegated when appropriate. 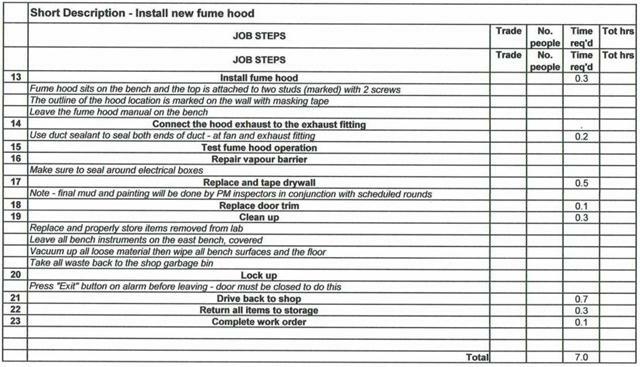 The level of detail required in a work plan depends on several factors, including the distance from the shop to the work site, the importance of finishing the job on time, the skill and experience of the tradespeople who will do the work, the availability of appropriate standards and the scope of work. If the scope of work is uncertain, careful thought should be given to all the possibilities that may be uncovered as the work progresses. It may be prudent to include some additional tools and materials in the work plan even if it is unlikely they will be needed. It is clear from this example that for a planner to work efficiently, the supporting systems must also be efficient. 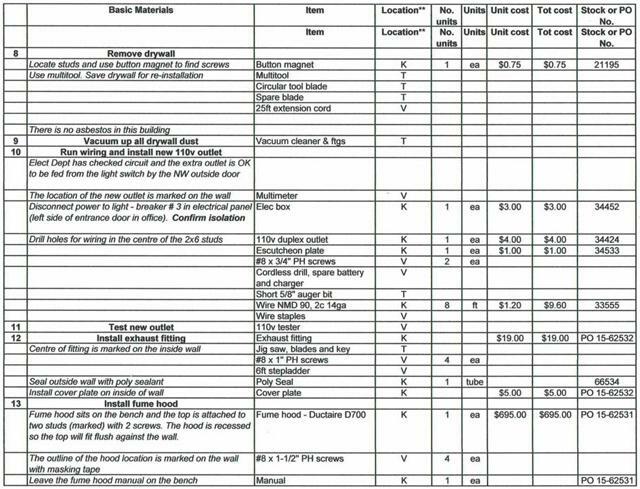 The most important of these are the stores cataloging and staging processes, the purchasing process, and the technical equipment and standards information systems. The discipline in managing the tools and supplies that are outside of the stores' control is also important. The scope of any project to improve planning will often include improvements to these supporting processes.